Prime Minister Narendra Modi today kickstarted work for Zojila tunnel, Asia's longest and strategic bi-directional tunnel, to provide all-weather connectivity between Srinagar, Kargil and Leh. The prime minister who is on a day's visit to all the three regions -- Leh, Kashmir and Jammu-- of Jammu and Kashmir also attended the closing ceremony pof the 100th birth anniversary celebrations of the 19th Kushok Bakula Rinpoche (Buddhist spiritual guru) here. The tunnel will cutting down the time taken to cross the Zojila pass from three and a half hours presently to just fifteen minutes. The project aims at construction of 14.15 kilometer long two lane bi-directional single tube tunnel. 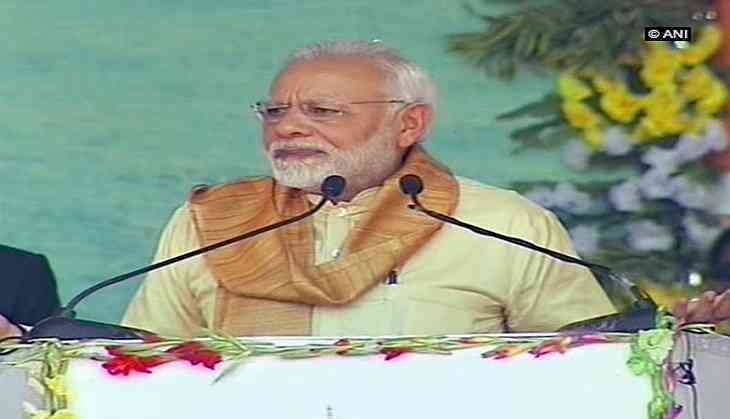 At the ceremony here, Modi said projects worth Rs 25,000 crore would either be initiated or inaugurated today in all three regions and it showed the commitment of the central and the state governments towards the speedy development of the state.